The action is fun, as if michael bay took to animation, but the story is pretty ordinary and expected. The Best thing about Madagascar 3: Europe’s Most wanted, is the action. We all hate Michael Bay (Transformers) and wish he would go back to making movies that were at least half decent (Bad Boys, The Rock), but the one thing that he does well is action. When he uses too much computer work, as in the Transformer films, we do not really care about the action. We are taken out of it. However, when people are involved, what he comes up with is always pretty cool. That is what worked about his better movies. Well, the action in Madagascar 3 is like the kind of thing Michael bay would do, if he were making an animated movie. Every stunt is spectacular and out of this world exciting. The best one is probably early on in the movie, as the animals find themselves in Monte Carlo, racing a jeep around the streets. They have just escaped from Africa and now pop-up here, with their car slamming into everything in sight. In addition, a female animal catcher pursues them on a motorcycle, which is like some form of superhero. At one point, the animals dump tons of fish out of the back of their jeep. This animal catcher jumps off her motorcycle, hoists it above her head, and slides through the fish on the ground. That had the kind of thing that works about this movie. The storyline unfortunately is just average. The characters want to get back to central park in New York. That is where the first movie began and they have not been back home since. There is a cool scene early on where the characters make a version of and New York City out of sand and Alex, the lion (voiced by Ben stiller), looks at every bit of it carefully. In addition, as he is doing this, the sand structures turn into the real structures and we see Alex, back in central park, commanding everybody’s attention. However, the cool scenes and ideas pretty much run out at the halfway point. The characters find themselves at a train yard at night with the police in heavy pursuit. They open one of the train cars and find that there are circus animals inside. They tell these circus animals that they are circus animals too, in order to be let into the car. In addition, just like that, they escape. Now the rest of the movie will be about the circus. Most of the animals there are welcoming, and in fact, Alex even strikes up a romance with one of them. Then there is the tiger with his German accent that is completely tough and unhappy. We learn through flashback how he had this uncanny ability to leap right through the tiniest of hoops. The problem is, we never get to see it. Instead, we see him get ready and then jump, at least four times, but the moment where he actually gets through the hoop is shied away from. We do not get to see it at all. It happens off screen every time, and we just see him afterwards, celebrating. It is very annoying. I suppose the idea is that seeing him go through the hoop would look too fake and silly, but by not showing us at all, it just points out how fake the idea is even more. It is so fake that there was no way for them to possibly make it look real. Not even once. I would have at least shown it to us when the hoop was a little bigger. The plot becomes routine as the movie goes on. Our foursome of main characters, including Marty the Zebra (voiced by Chris Rock), is hiding something from the other animals. They are living a lie, claiming to be circus. Like any movie with a lie as it’s base for a plot, eventually the lie will come out. We’ve seen it a thousand times before, going all the way back to Shakespeare and works like the taming of the shrew. 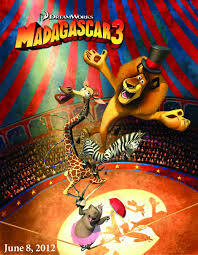 I never saw the second Madagascar, and I really have no interest in it. The first one was good, because the voice work was spectacular, but even there; the plot was not anything great. Not when Pixar, the other animated studio has Ben making things like the incredible and ratatouille. Still, the first one was fun because it was somewhat fresh. Animals escape from a zoo and find themselves out in the wild. I especially liked all of the stuff at the central park zoo, showing the daily routines of the characters. However, none of that is here, in this third movie. The movie did very well, of course, and many people credit the wig campaign, which shows the characters wearing multi-colored wigs on the advertisements, along with the tagline, “wig out.” I think it is a pretty stupid add. It says nothing about the movie at all. That being said, obviously kids liked it, and it got the job done. There are a number of pop songs in the movie, such as Katy Perry’s firework, and that is one major way that movies of today differ from the animated classics of when I was a kid. Movies like the little mermaid and beauty and the beast had their own songs, written and sung only for the movie that became instant classics. Now, that effort is no longer made. The end of the movie might be exciting and lively, just like the beginning, but after sitting through the tedious plot, it does not really feel like anything special. It is an okay movie, with some definitely redeeming factors, but it is certainly nothing great.